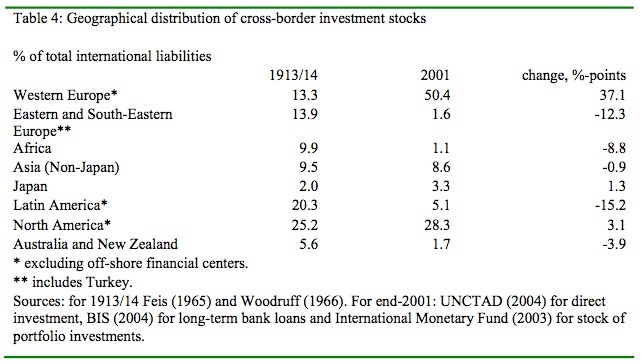 In the Victorian era, most of the world’s surplus savings flowed from Western Europe to the developing countries of the time, which included some rapidly industrialising ones like the United States. So American railroads and canals were financed, at least in part, by European capital. At the same time, European portfolios also included the raw materials and agricultural output of what today is called the Third World. These would be extracted, processed and exported to the European market. Of course when I say “Europe”, I mean mostly the United Kingdom, for it was the premier global investor par excellence, by far the largest shareholder in the global stock of foreign investments in 1870-1914. The UK had accumulated huge savings surpluses from its early industrialisation and these were exported around the world. Sometimes, historians talk of Britain’s “informal empire” which might have been more important and influential than the formal empire of the red bits on the map. I agree with that view. 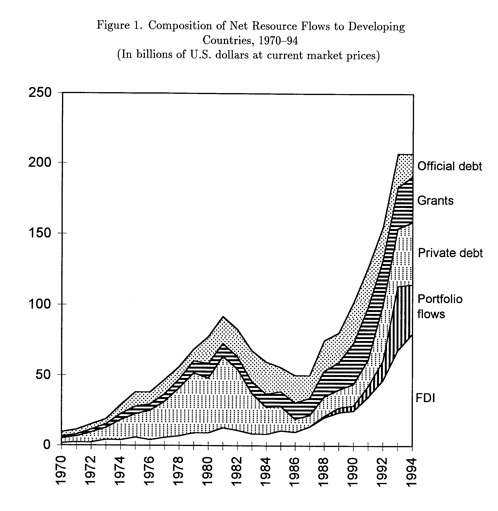 Figure 10 both illustrates the periphery’s need to draw on industrial country savings, as well as an important dimension in which the globalization of capital markets remains behind the level attained under the classical gold standard. 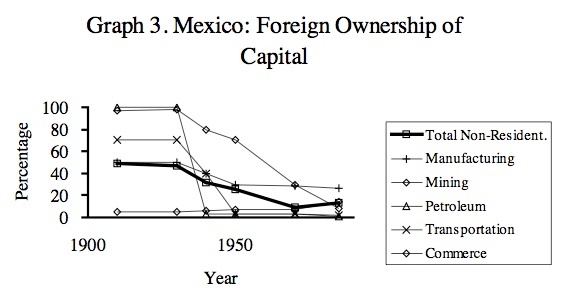 In the last great era of globalization, the most striking characteristic is that foreign capital was distributed bimodally; it moved to both rich and poor countries, with relatively little in the middle. Receiving regions included both colonies and independent regions. 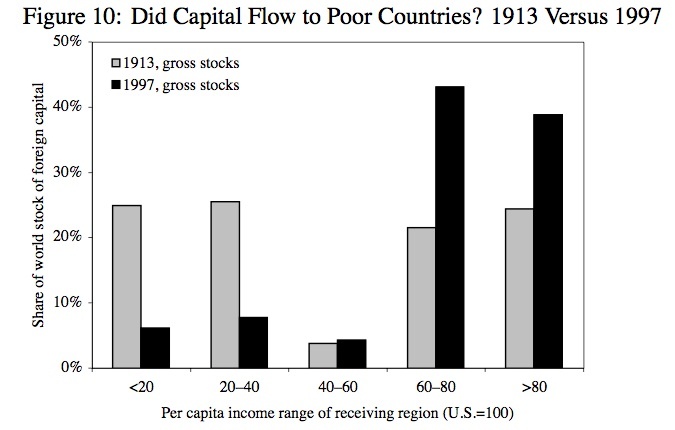 The rich countries were the settler economies where capital was attracted by abundant land, and the poor countries were places where capital was attracted by abundant labor. Personally I’ve never found the Lucas Paradox terribly paradoxical — it’s one of those “paradoxes” that arise only from ahistorical models of the world. Basically, in the 19th century, raw materials had high value relative to the manufacturing process that converted them into stuff. But with the exponential rise in technological sophistication, the manufacturing process became relatively more valuable (=added much more value than previously), and the materials intensity of output (the amount of raw material input per unit of output) declined. Put simply, more was being made with less. But such a process requires technological mastery, and that mainly exists in the rich countries. So whereas Victorian investors were concerned with acquiring high-value raw materials for use in production (and consumption) at home, mid-20th century foreign investment was more about owning the high-value-adding manufacturing operations that produced stuff for the internal markets of the rich countries themselves. Ironically, most of the resource transfers from the rich to developing countries in the form of loans were just reshuffling of ledger entries in Western and Japanese banks. In the 1970s the prices of all commodities skyrocketed — oil, copper, gold, tin, coffee, everything. 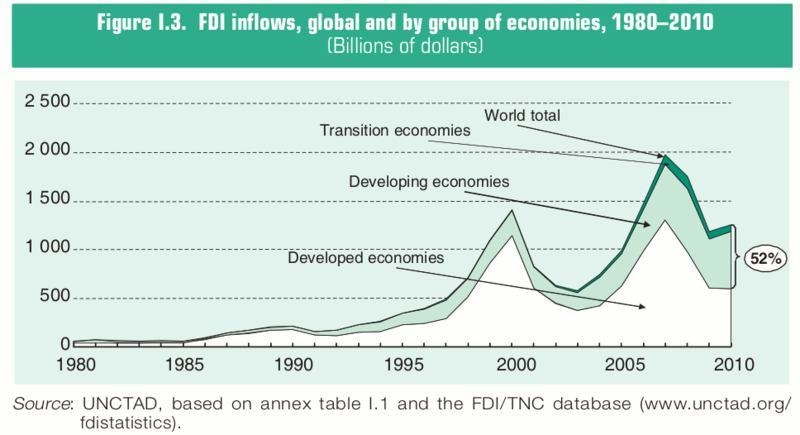 So developing countries were awash in money. Yet, lacking strong financial institutions they (including many of the Arab oil producers) deposited the commodity revenue in western banks. Thus the dollars, francs, yen, marks & pounds exchanged for Chilean copper, Iranian oil and Ethiopian coffee were re-lent to a different mix of developing countries. What later followed is one of history’s great financial catastrophes.